Video (01:40) : Prince's Paisley Park in Chanhassen, Minnesota has permanently opened for public tours, following unanimous approval by the Chanhassen City Council. Above: A sampling of food from Paisley Park Kitchen. Dine like Prince. That’s what Paisley Park is offering when it opens again as a museum this weekend. 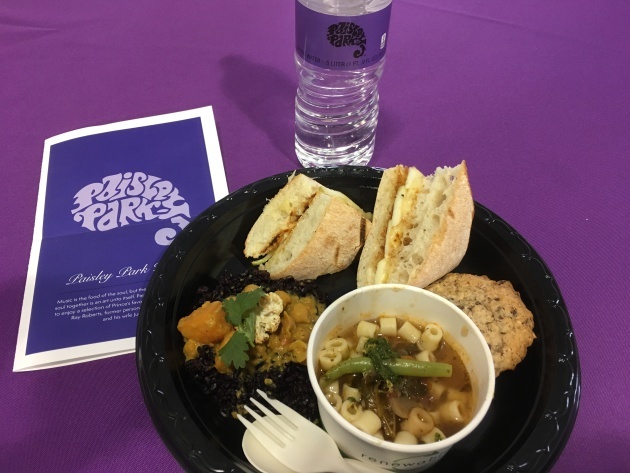 Paisley Park Kitchen will offer 11 different vegan and vegetarian items, “in accordance with Prince’s wishes.” The dishes, drinks and desserts are even prepared by Prince’s personal chef, Ray Roberts, and his wife Juell Roberts, of People’s Organic restaurant. The dishes range from coconut curry with black rice and chickpeas to jerk popcorn to vegan rice crispy bars, which constantly stocked Prince’s fridge for the “perfect 4 a.m. energy snack,” according to the menu. At a Wednesday media tour, we sampled four items. The curry ($12.50) -- also served the night Kendrick Lamar visited Paisley in 2014 to celebrate the releases of “PlectrumElectrum” and “Art Official Age” -- was flavorful but not spicy, especially for curry. The minestrone soup ($7) had lots of pasta noodles and veggies. Again, it was flavorful but not spicy. The real winner is the Minnesota grilled cheese ($9), featuring savory white cheddar and gouda, grilled on ciabatta bread, with apples and honey (“which Prince especially loved”). We agree. Scrumptious taste, soft-and-crunchy texture, and the honey is a nice, sweet but not-too-sweet touch. Also sampled was a cowgirl mini ($5), a cookie made of rolled oats, coconut and white and dark chocolate. These tasty treats – great texture, not too sweet but just sweet enough in a I-love-my-coop way – were often served at Paisley, according to the menu, including the last party Prince had there on April 16. Other menu items include a tropical smoothie, flatbread pizza and pancakes, Prince’s favorite. “Prince loved pancakes at any hour of the day,” the menu says. The food is served in a giant tent, where Prince merchandise is sold. Reservations for Paisley Park tours, which cost $38.50 and $100 (VIP), must be made in advance at officialpaisleypark.com.